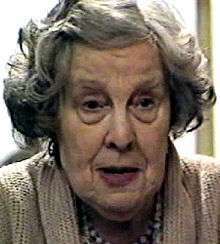 Anna Eva Lydia Catherine Wing, MBE (30 October 1914 – 7 July 2013) was an English actress who had a long career in television and theatre, but was best known for playing Lou Beale, the matriarch of the Beale family, in EastEnders. Wing was born in Hackney, London, and started out as an artist's model and later, during the Second World War, worked in East End hospitals. At age 30, she married the actor Peter Davey, by whom she had a son, actor-director Mark Wing-Davey, but the marriage ended in divorce after six years. Her seven years as the lover of Philip O'Connor, a surrealist writer and contemporary of Stephen Spender and Laurie Lee, saw her spend some time as a nursery teacher in West London. With her new lover she had a second son, Jon O'Connor. Wing is best known for portraying the Beale and Fowler family matriarch Lou Beale on EastEnders from the show's inception in February 1985, until the character was killed off in July 1988. She quit her role in the hit show as she was unhappy with the direction in which it was going, but later reflected that it may not have been the right decision. She made an earlier soap appearance in Market in Honey Lane for ATV in the late 1960s. She also had a role in the Doctor Who serial "Kinda" in 1982. Other TV credits include Dixon of Dock Green, Z-Cars, Play for Today and The Sweeney. Her film career included roles in Billy Liar (1963), Two Gentlemen Sharing (1969), The 14 (1973) which also featured her future EastEnders co-star June Brown, A Doll's House starring Jane Fonda (1973), Providence (1977), The Hound of the Baskervilles (1978), The Ploughman's Lunch (1983), and 3 British horror films - Full Circle (1977), The Godsend (1980) and Xtro (1983), in which her character was killed by a life-size Action Man doll. After leaving EastEnders, Wing continued to work on stage, playing the medium, Madame Arcati, in Noël Coward's comedy Blithe Spirit. She also had numerous television roles, including parts in Casualty, Doctors, French and Saunders, The Bill, as well as adding her vocal talents to the animated series Fungus the Bogeyman. Her later film credits included The Calcium Kid with Orlando Bloom, Tooth (2004), in which she played an ancient fairy), and Grandma in the 2007 film Son of Rambow. In May 2005 she attended the British Soap Awards, where she presented June Brown with a lifetime achievement award for Brown's portrayal of Dot Branning in EastEnders. In 2005, by now aged 91, Wing formed part of the cast of the short film Ex Memoria, directed by Josh Appignanesi and produced by Oscar-winning producer Mia Bays. The short film tells of an elderly woman's struggle with Alzheimer's Disease. Ex Memoria was nominated for a British Independent Film Award for Best Short in 2006. In April 2012, she appeared in the music video for Quarrel's 'Is It Cool?'. Wing attended the funeral of her EastEnders onscreen daughter Wendy Richard on 9 March 2009. She was a member of the Religious Society of Friends, the Quakers, and supported the Campaign for Nuclear Disarmament. She published several books, including a biography of Gummo Marx. She died in her sleep on 7 July 2013, at the age of 98. The episode of EastEnders that was broadcast the following day was dedicated to her memory, and was immediately followed by a 90-second long BBC News report, the headlines of which included her death. Her funeral took place in London. Adam Woodyatt was a mourner. 1 2 "Anna Wing, EastEnders' Lou Beale, dies aged 98". BBC News. 11 July 2013. Retrieved 11 July 2013. 1 2 Stuart Jeffries (11 July 2013). "Anna Wing obituary | Television & radio". London: The Guardian. Retrieved 2013-07-12. ↑ The London Gazette: (Supplement) no. 59090. p. 24. 13 June 2009. ↑ Archived April 16, 2012, at the Wayback Machine.